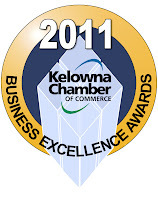 2011 Business Excellence Finalist – Thank you Kelowna! Total Office has been nominated for the ‘Small Business Award (1-10 employees), aside All Occasions Party Rentals and X.10.SION 207 Clothing/Surf Culture. We will like to extend a sincere ‘Thank You!’ to the businesses and individuals of Kelowna for their commitment and patronship. 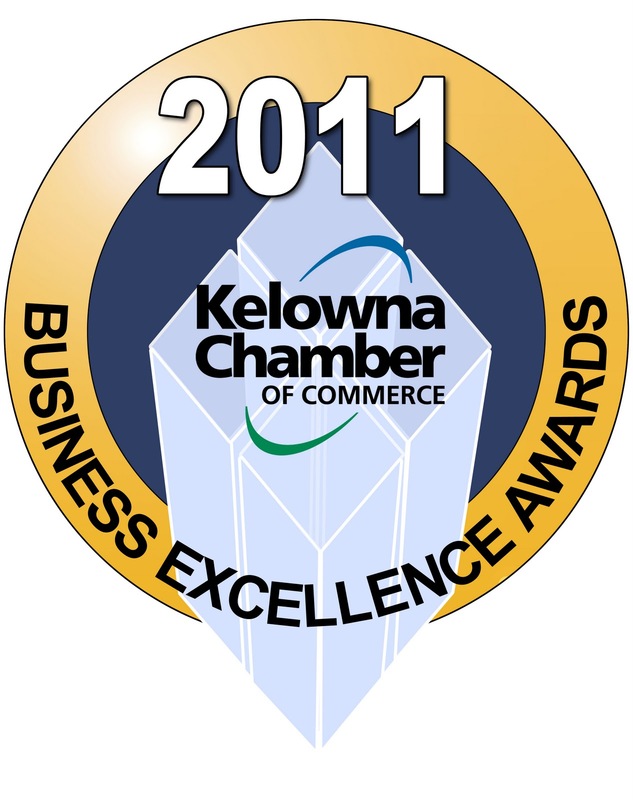 “Kelowna, BC – Sixteen finalists will be honored at the 24th Annual Business Excellence Awards on October 17th at the Delta Grand Okanagan Lakefront Resort and Conference Centre where five category recipients will be announced, along with the Business Leader of the Year recipient. Presented by the Kelowna Chamber of Commerce and Platinum Sponsors the Business Development Bank of Canada (BDC) and Farris, Vaughan, Willis & Murphy LLP, the popular Kelowna event is part of the annual Small Business Week (r) activities (October 16 – 22, 2011). http://totalinteriors.ca/wp-content/uploads/2011/10/businessexcellence1.jpg 1600 1266 Daniel Joseph http://totalinteriors.ca/wp-content/uploads/2016/11/Total-interiors-logo-300x100.png Daniel Joseph2011-10-11 16:55:002013-09-13 11:20:592011 Business Excellence Finalist - Thank you Kelowna! Expansion Casegoods is one of the most extensive laminate casegoods offerings on the market, striking a perfect balance between price, functionality and contemporary aesthetics. Expansion Casegoods meets a broad range of freestanding applications and diverse office plans. A uniform product platform simplifies planning and provides a consistent aesthetic throughout the office. Universal components and an array of design options accommodate diverse needs and meet individual budget requirements. Overlapping worksurfaces and overhead cabinets mount to Wall Panels to create a light, open look in small and large configurations. Secondary desks – available up to 108 inches wide – create multi-level workstations, maximize use of space and unify structure and appearance. A broad offering of desks, credenzas and returns are available preconfigured or as modular units. Expansion Casegoods encompasses a wide selection of storage. Overhead Cabinets, Hutches, Hutch with Towers, Towers and lowheight storage increase planning flexibility. Wall Panels and storage units in different heights create a range of elevations. Overhead storage mounts as a Hutch, on drywall or on Wall Panels for diverse applications. In addition, the Expansion Casegoods offering includes an extensive selection of meeting and conference tables suitable for small informal meeting rooms or a spacious boardroom. Expansion Casegoods is GREENGUARD® Certified for Children & Schools, complies with BIFMA e3, meets LEED certification credits 4.1/4.2 NC & CI and 4.5 CI and is manufactured in plants certified to ISO 9001 and ISO 14001 Environmental Management Standards. FSC wood is an option. Ergonomists agree that alternating between sitting and standing results in decreased discomfort, increases productivity and, when given the option, is the preferred method of working by desk users from around the world. Variation in movement is the key to maintaining a healthy body and the ways to achieve this from a sitting position are extremely limited. Postural variation is the most effective way of reducing musculoskeletal discomfort through weight redistribution and repositioning. The pressure on the lower back, buttocks and legs is considerably reduced in a standing position as different sets of muscles are activated. When we move from a sitting to standing position our bodies natural inclination is to stretch and move. The immediate effect is a reduction of the pressure on the spine and improved blood circulation. 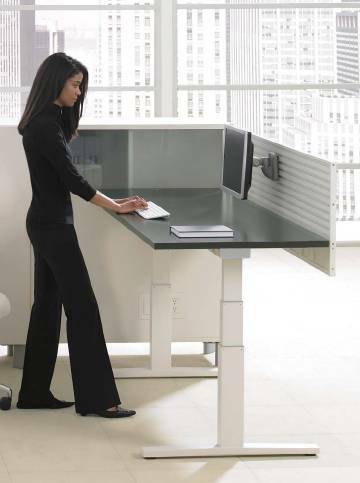 A height adjustable desk allows the user to maintain this variable position for as long as they desire whilst still continuing to work as usual. Technology has taken us to a stage where we are most productive in front of our PC and although we are advised to take regular breaks and move around the office this does not always happen. Sit Stand technology allows the user to achieve many of the benefits they would from leaving their desk while continuing to work. You get more done when you’re standing up – when you’re sitting, you’re naturally recessive, when you’re standing, you’re ready to do something. Only an Electric Sit Stand Desk provides true height adjustability as the height can be altered by the individual at the touch of a button throughout the working day as required; the important thing is to vary your routine. Make a point of getting up every half hour or so and walk around. One desk is suitable for all people of different shapes and sizes. This caters for a mobile workforce either sharing desks in “hot desk” situations or in call centres with a constant turnover of staff. The flexibility of these desks also accommodates people with disabilities and existing back problems. Reduce problems caused by static and sedentary postures that can lead to musculoskeletal injuries and work related stress issues. Incremental changes allow the user to easily change heights between tasks such as typing and writing and assist with comfortable collaboration with colleagues. Standing burns up to 30% more kilojoules than a static seated position. Good Ergonomics is good economics. A healthier, happier staff will result in a more productive workforce. http://totalinteriors.ca/wp-content/uploads/2011/06/clip_image0021.jpg 483 360 Daniel Joseph http://totalinteriors.ca/wp-content/uploads/2016/11/Total-interiors-logo-300x100.png Daniel Joseph2011-06-28 15:33:002013-09-13 11:39:32ARE YOU SITTING DOWN? Teknion embraces change and its inherent possibilities. Our culture is one of innovation. A diverse, yet integrated product line allows companies to adapt to new forms of work as they unfold. Teknion products perform independently and in concert, combining in virtually unlimited configurations that fit new needs as the world’s economies and cultures evolve. At Teknion, we seek to realize the power of design to enhance our ability to interact with one another and our world. Teknion creates furniture that connects people, technology and spaces. Integrated design with unlimited possibilities for the future of business. Integrated Product PortfolioWhen Teknion began operations in the early 1980s, it did so with a single line – the Teknion Office System, or T/O/S. Today, the company offers a number of different panel-based, freestanding and desking systems, including District, Leverage, Transit and T/O/S. Marketplace, Ability and ie are Teknion’s freestanding systems offerings and Expansion Desking is the company’s desking line. Teknion offers two architectural or demountable wall products – Altos and Optos. Teknion seating products range from stacking, lounge and general-use to task, wood and executive. Popular seating lines include Contessa, Savera, Amicus, Fitz, Marini, Visio, Volume, Zone, Aegis and Synapse. The company also offers a wide range of storage and filing for use inside and beyond the workstation, including Almanac, Ledger and the Universal Overhead. The Tables & Collaborative Spaces program features an array tables and complementary storage and work tools designed for boardrooms, meeting rooms, training rooms, café/lounge and dining areas. Complements – Teknion’s Ergonomics & Accessories Program – is designed to promote healthy working postures and to organize and personalize the workspace. Industry Design AwardsTeknion continues to earn many prestigious awards, the majority related to new product design and innovation. Within the past few years, many of the company’s new products – District, Marketplace, Expansion Desking, Fitz and Synapse – have won a host of international honors. Competitions in which Teknion has received awards include Best of NeoCon, Good Design, NeoCon Green Stars Awards for Environmental Excellence, Best of Canada, Best of Year, the Design Exchange, the FX International Interior Design Awards, iF product design award and the Innovation Awards. Check out this great video “Workplace One”. Follow the link below and enjoy. Please call us with any questions you may have at 250.717.1626 or toll free at 1.800.558.DESK (3375). Total Office your Authorized Tekknion Dealer. that are made to stand the test of time and last. Challenge Workplace Strategy. 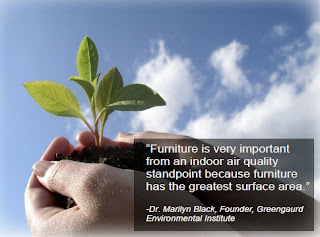 Internally we recycle used furniture in our Pre-Owned Furniture Division, separate and recycle all packaging and reuse as many of the products we can. Our goal in adopting the Go Green Business Challenge is to further enhance our green initiatives by empowering our people to achieve greater success. We have the resources and the expertise essential in designing and implementing environmentally and user friendly long-term office spaces, with the least amount of impact on our environment. apply our extensive portfolio of products. It saves time, money and the environment by adapting to the constant change in the workplace. 1) the Traditionalists; 2) the Baby Boomers; 3) Generation X, and; 4)Millennials. The next question we need to ask is: What generation do I belong to? To answer this we have to take a look at the generational divide. Traditionalists were born before 1946. Baby Boomers were born between “1946-1964”. Generation Xers were born between “1965-1980” and the Millennials were born between “1981-2002”. A more interesting way to determine the generation you belong to is to ask yourself, ‘Who was my favorite musician growing up? Glen Miller, The Beatles, Madonna, or Usher? What about your favorite toy? Marbles, a hula hoop, Barbie and G.I. Joe, or maybe it was a Gameboy or Playstation? The attraction and retention of workers is a key issue facing employers today. There is a need to create working environments that will appeal to the employees you want to attract and retain. The answer is not in one size fits all strategies, it is in creating a range of solutions to meet all generations needs, as well as address how everyone’s workplace needs change throughout the day/week. educating, assisting, brainstorming, floor planning and installing.